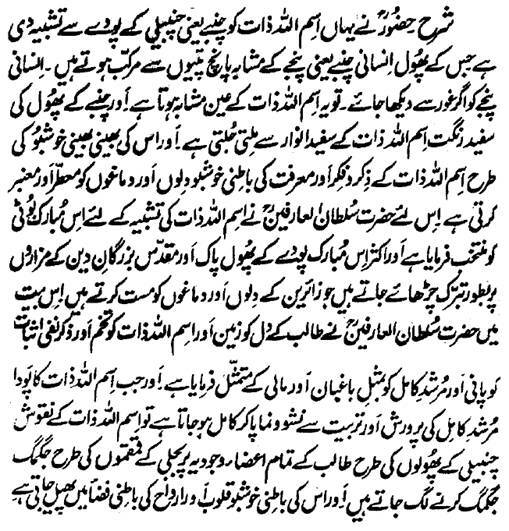 Here Hazrat Sultan Bahu Rahmatu-Allahe Ta-aala Alaihe has used the Chamba (a kind of Chambeli-Jasmine plant) as metaphor for the Name-Allah-the-Essence (Ism-e-Allah-Zaat) . Flowers of Chamba plant have single corolla of five petals. Human hand also has five fingers and if we carefully see the human hand, it exactly resembles with the Name-Allah-the-Essence (Ism-e-Allah-Zaat) and the white color of the flower Chamba resembles with the white Anwaar of the Name-Allah-the-Essence (Ism-e-Allah-Zaat) and like its cool and sweet fragrance, the Inwardly fragrance of the Zikr Fikr and Marifat of the Name-Allah-the-Essence (Ism-e-Allah-Zaat) freshens and perfumes human hearts and minds. That is the reason that Hazrat Sultan ul Arifeen Rahmatu-Allahe Ta-aala Alaihe has chosen this blessed herb as metaphor for the Name-Allah-the-Essence (Ism-e-Allah-Zaat) and often the flowers of this blessed plant are showered on the sacred graves of the Saints. These flowers turn the hearts and brains of the visitors Mast. 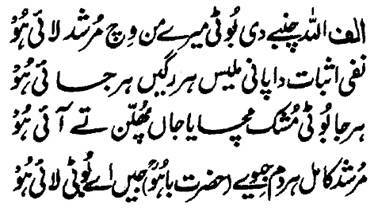 In these couplets, Hazrat Sultan ul Arifeen has called the heart of the Seeker as the likeness of soil, the Name-Allah-the-Essence (Ism-e-Allah-Zaat) the seed and the Zikr of the Nafi Asbaat water and the Murshid-e-Kaamil the gardener. And when the plant of the Name-Allah-the-Essence (Ism-e-Allah-Zaat) becomes Kaamil under the care and nurture of the Murshid-e-Kaamil, the inscriptions of the Name-Allah-the-Essence (Ism-e-Allah-Zaat) start shimmering like the electric bulbs on the entire parts of the body of Seeker in the likeness of the flowers of Chamba and their esoteric scent spreads in the Inwardly atmosphere of the Quloob (hearts) and Arwah (Spirits).